I hope those of you in Britain are enjoying the Bank Holiday. 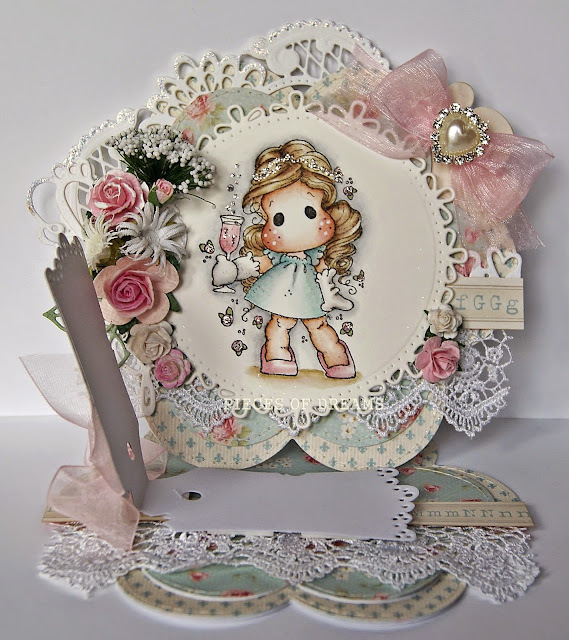 I have made this card for you all, using "Golden Week Tilda" from the new Magnolia Tilda Sakura collection. I don't have a favourite amongst this collection, I am totally in love with them ALL. The papers are Maja and I have "shabbied" and stitched them all. Tilda was coloured with distress inks on watercolour paper. I added lots of glitter, liquid pearls, pearls and sparkly ribbon for the bling. 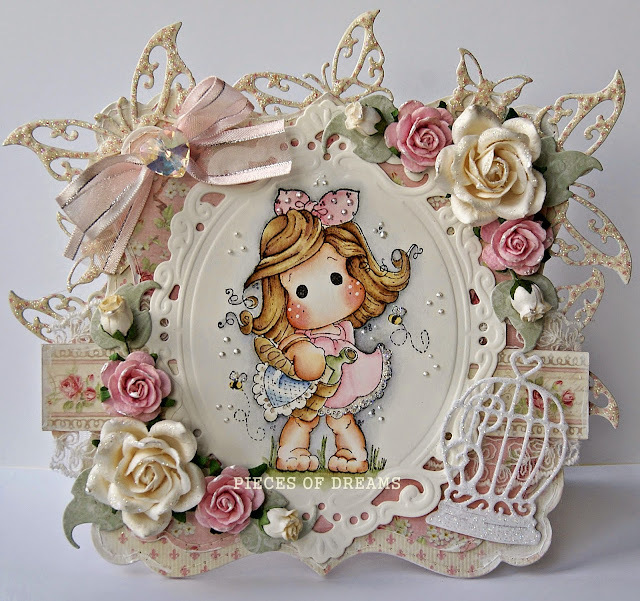 The lace, flowers and cutie birds are from my stash, held with a little resin flower. Gosh, I loaded this card up so much it's hard to mention everything! The shape was cut with Go Kreate dies, the fancy oval at the back is Joy Craft and Tilda has been cut with a Spellbinders die. So apologies for being late. Enjoy the week ahead. I'm suffering with back problems at the moment. I pulled a muscle in my back bathing our Labradoodle and if I sit for longer than five minutes it becomes painful to move. Luckily, I made a few cards last week so I still have something to put on my blog. The new Magnolia Tilda Sakura collection arrived on Friday morning and by Sunday I had made four cards with them. This is the first one, "Tilda with Ribbon Shoes". 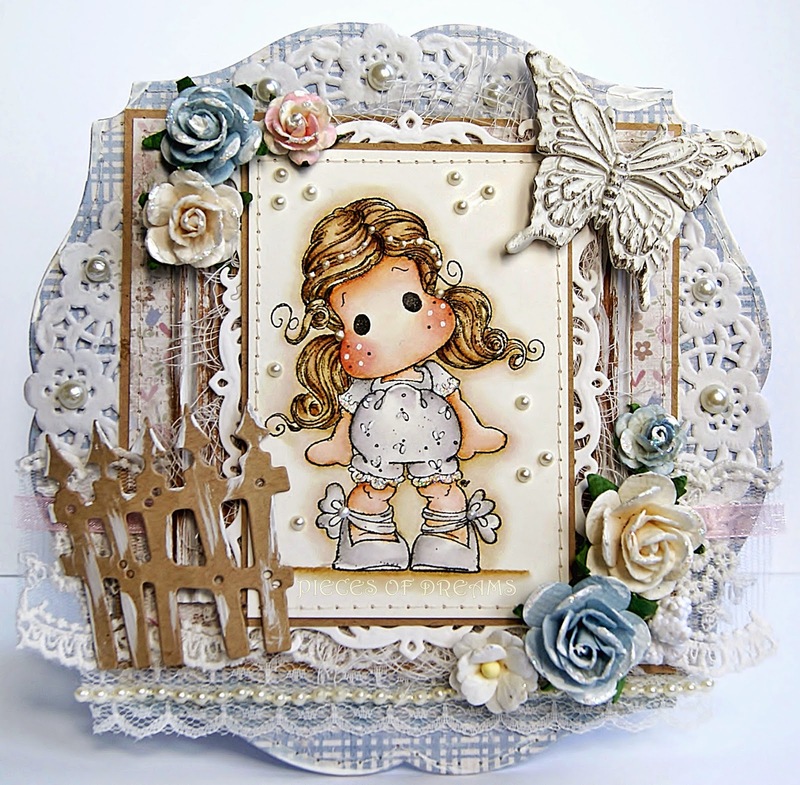 The papers are by Maja, "Vintage Baby", stitched and gesso'd on the edges. As usual the colouring has been done with distress re-inkers with additions of Liquid Pearls, tiny pearls and stitching. I used mainly kraft card this time with some painted corrugated card for contrast and a doily background. Do you think I love gesso? Ha-ha! Somewhere under there, are some cheese-cloth, lace, ribbon and pearls...The big butterfly is by Prima and the flowers are from my stash. I hope to add another card tomorrow. Have a wonderful bank holiday weekend everyone. I spent most of Saturday in the garden planting new bedding plants for the Summer. The weather has been wonderful here in London. Then yesterday I coloured a few of my new Magnolia Sakura stamps ready for cards. They are an absolutely gorgeous collection of stamps! 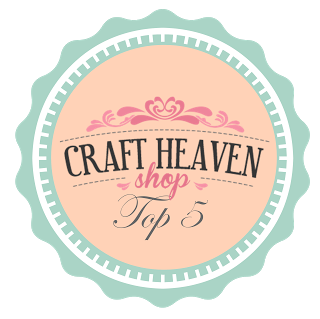 ALL ABOUT MAGNOLIA CHALLENGE of "FLOWERS"
You could win a secret prize from Magnolia or a £10 voucher from Live and Love Crafts. I used distress inks to paint this stamp with Glamor Dust to make her pink champagne sparkle....... and Tiara Stickles to add bling to her tiara. The inks were blended to make the colour as near to the papers as I could. These papers are the oh so pretty Pion, Paris papers. I love their soft vintage design. They have been cut with Go Kreate dies and stitched with top stitch thread. 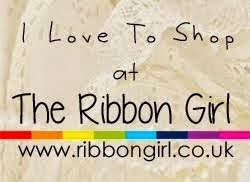 The ribbon, thread and some of the flowers are available from The Ribbon Girl. The papers and lace are from Live and Love Crafts. The Magnolia tag opens for a message or sentiment. 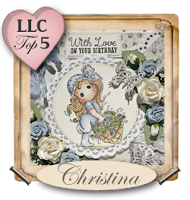 I hope to visit your blog to see your "Flower" cards. 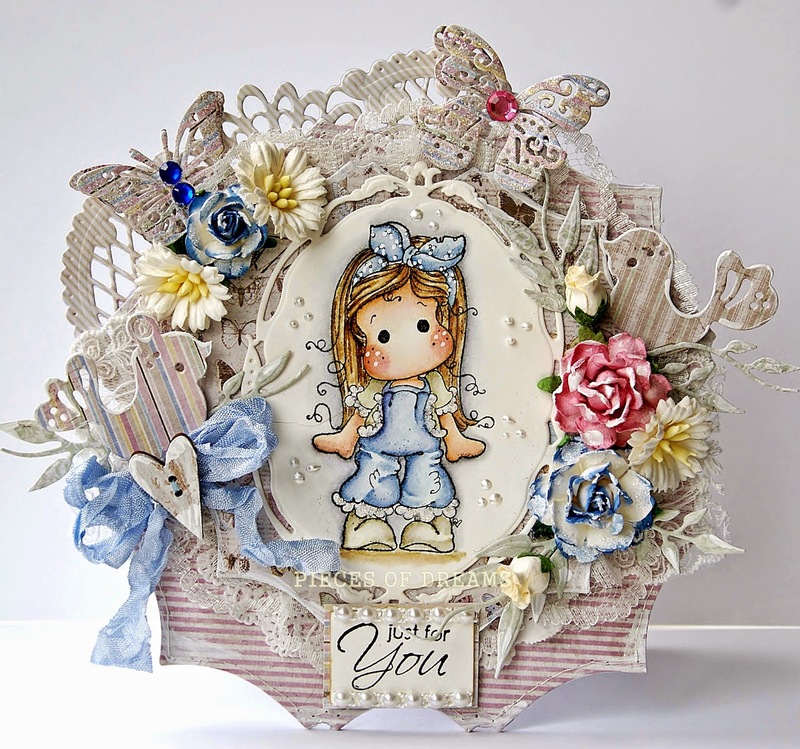 Pop over to the challenge you will see the wonderful creations that my fellow design team members have made for your inspiration. 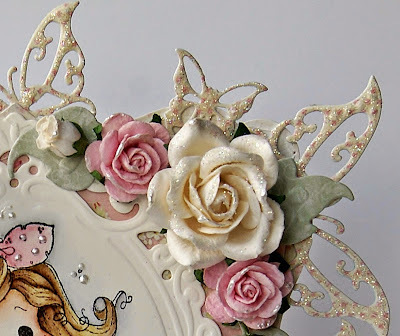 Fussy & Fancy or Clean and Layered...of course, my card is fussy and fancy, and girly, and pretty. That's my style. 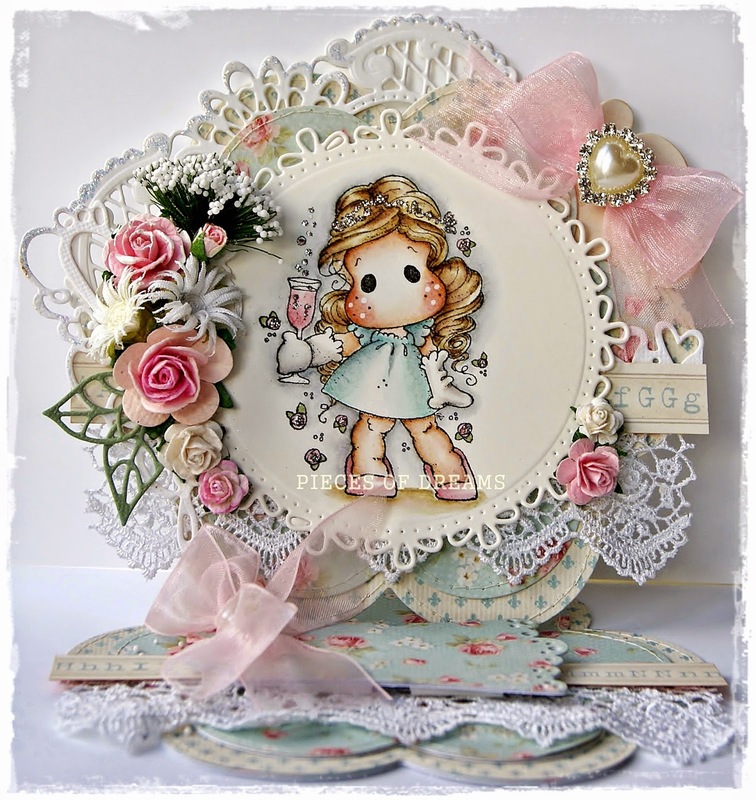 I have used little"Picnic Tilda" from Magnolia's Pink Lemonade collection. She is a favourite of mine. I am eagerly awaiting the new "Sakura" Collection, but have heard that there has been a shipment delay. Hope they are here soon! Anyway, my choice of papers was the pretty Pion Paris papers, matched to a border and edged with lace - all from Live & Love Crafts. The papers are stitched and I have used gesso to the edges. Tilda has been painted with distress re-inkers, then finished with glamour dust and Liquid Pearls. The flowers have been edged with gesso and sprinkled with Glamour dust. 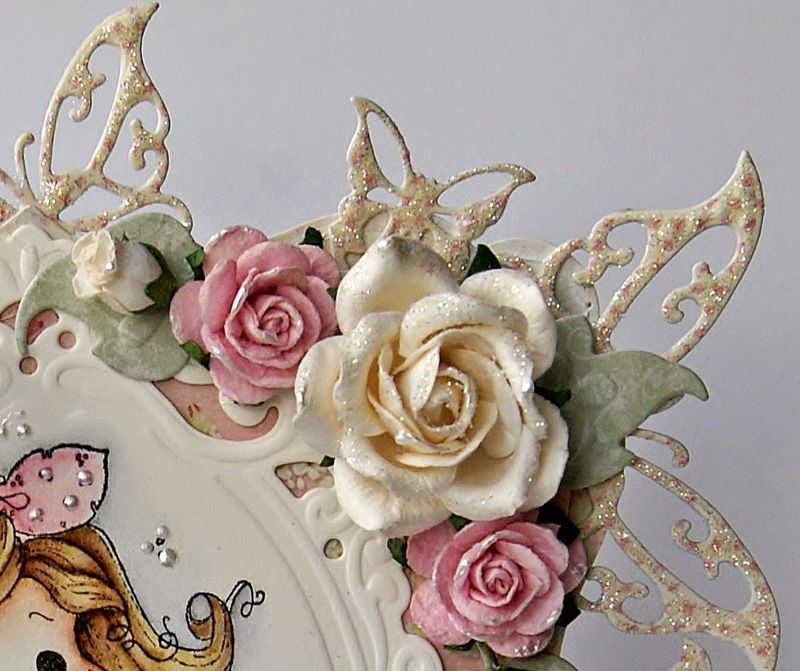 The butterfly border also sparkles with Glamour Dust. Hope you have enjoyed the May bank holiday. Mike has worked most of it, twelve hour shifts. So I have been in my craft room with the two dogs, who love to help by eating the scraps of paper that fall on the carpet. Here is a card I made a while back using little " Tilda in Summer Pants". I cut up some branch dies from Joy Craft and added two Magnolia birdies. Of course there are other embellishments including butterflies, gems, pearls and glitter, but I love those birds! There is lots going on here. The papers are Maja Spring, stitched and daubed with gesso. Tilda is surrounded by ivory lace and I have added a seam binding bow with a wooden heart. All Ribbon Girl. The flowers and pearls are from my stash, I have added Liquid Pearls and Glamour Dust to Tilda who has been painted with distress inks. 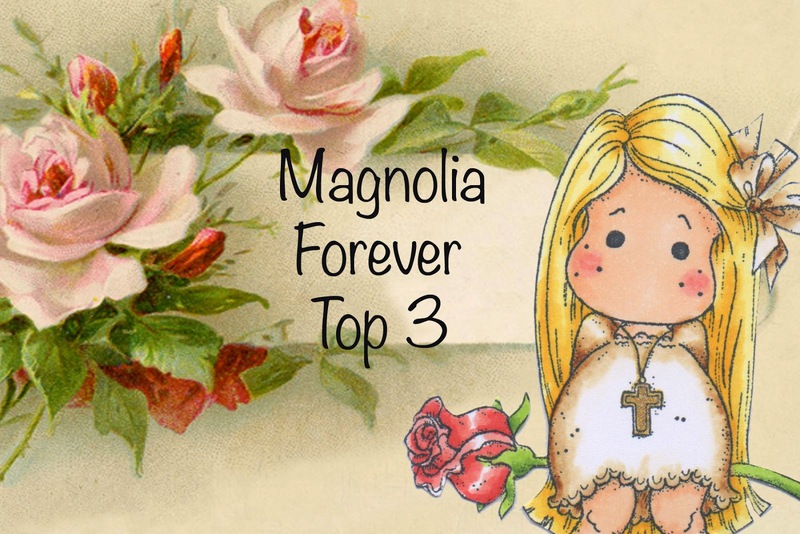 Don't forget, the new challenge over at "All About Magnolia". The theme for May is "Flowers". I would love you to join in. We had over 100 entries for our first challenge! I thought I would post a card to wish you all a lovely May bank holiday weekend. May is my favourite month and a time of celebrations as both me, my husband and our little granddaughter have birthdays. Little Daisy will be four and starts school soon...impossible! Time flies by. 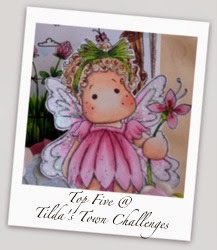 Here is a fun little card using "Fashion Blog Tilda". The papers are Maja, cut with Go Kreate dies and stitched. I painted Tilda with my distress inks and used Liquid Pearls and Tiara Stickles to decorate her. Around the Marianne die cut, I used some pearl stringing. I also used this over the lace. The satin bow has a pearl and diamanté heart embellishment and at the bottom is a white wooden heart holding a brass metal heart. The flowers, papers and heart are painted with gesso. I made a holder for the sentiment using twisted wire and dotted a few pearly hearts around the card. I like this stamp but I haven't seen it used on a card yet. I don't know why because she is a real cutie and comes to life when she is coloured. We are off to Rochester today, where the annual Sweeps Festival and May Day festivities are being held. What ever you are doing, have a lovely weekend.